It is essential you share a full history of presenting symptoms as well as any previous immune issues as these will be taken into consideration when testing begins. A history of previous health issues may be contributing to your present illness. It is essential you divulge those to save time in testing and helping me analyse better what is the main cause or stressor to your organs. Your history can be either forwarded by email to me or in the clinic via consultation form. 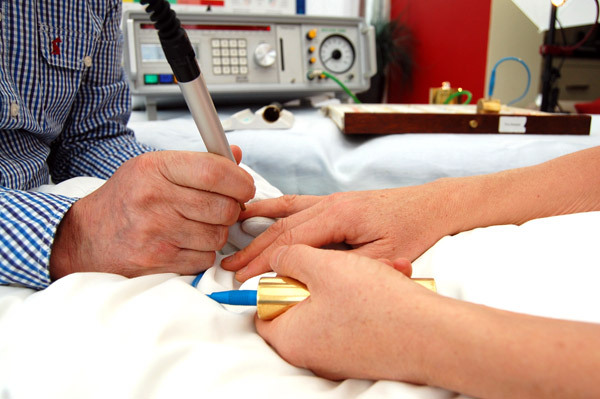 Bioresonance testing is carried out by using a small probe on acupuncture points on the fingers called meridians. These meridians represent organs such as the lymphatic system, lungs, colon, nervous system, circulation, allergy, hormone & glands, heart and small intestine. On the toes we test; Pancreas/spleen, liver, joint, stomach, connective tissue, skin, fatty tissue, gallbladder, kidney and bladder. Any organ reading from this that is higher or lower than the norm will be tested for pathological strains like viruses, bacterias, fungus or parasite as well as environmental strains such as metals and chemical strains. More and more illnesses are being linked to these strains as research improves. With over 2,000 testing vials and 20 years experience it is unusual if I cannot seek out the stresses to your symptoms. Treatment comes mainly through using frequency therapy with the Bicom device that has a long history of clinical success with patients with chronic and acute conditions. All toxin stresses tested can be eliminated or reduced through the therapy allowing the immune system to recover to previously balanced health. A specific range of treatment plans are available after testing to suit each individual patients needs whether they present with an acute or chronic condition. Advice on diet, nutrients that work for the most difficult cases is given after testing to see if they are going to improve or eradicate your symptoms. A range of clinically researched medicines to reduce inflammation and restore immunity can be individualised through the Bicom machine too which tailors them to suit each and individual patient for whatever condition they have. This is personalised therapy with medicines as well as receiving individual programmes on the Bicom to restore energy to each stressed organ. In all, there are over 400 programmes of therapy within the device for a whole range of symptoms and conditions. With my many years experience with Bicom and continual research there are some distinct patterns in patients with Chronic Fatigue Syndrome, Fibromyalgia and Multiple Chemical Sensitivity as well as other related conditions. Testing and treating these strains leads to real changes and a return to optimum health. See just a few of the many testimonials.